$29.00 – I scored big. Recently, at The Goodwill on Garnett I bought 12 purses to give away during our Goodwill Power of the Purse promotion this Fall. When I got home it occurred to me that I didn’t want to give this particular purse away. Inside, I saw the purse was 100% leather. Leather name brand purses run for anywhere between 100.00 and 300.00, more for brands like Coach and Brahmin. What I like best about this purse is I can wear it on my shoulder for hands free activities, like messing with an umbrella or a bag of groceries. 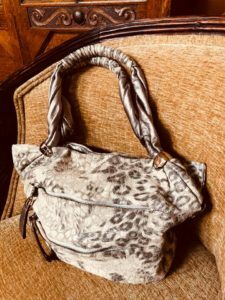 It’s rare that I would like an animal print purse because most are bold and I don’t like planning my outfits around a purse. 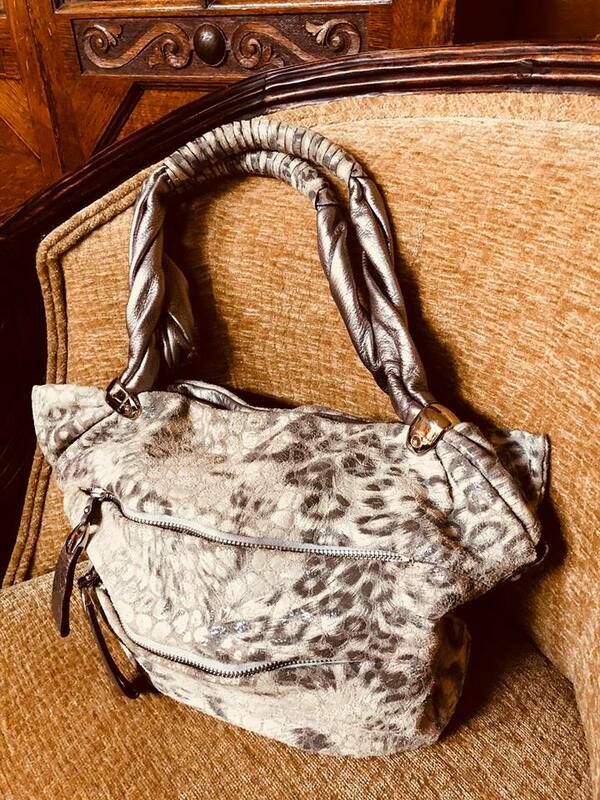 The print is grey and grayish beige so I wouldn’t be afraid to use this purse like I would any neutral color. This one seems to go with most everything. The print is subtle and gorgeous. It’s perfect for Fall but I have no problem carrying in in the summer. I’m carrying it today. An all around excellent find!